This is the VT500E... probably the 'E' referring to European. This was produced from '83 through '88 and marketed over in Europe. A good friend of mine over in Holland sent me a picture of himself posed behind his "E" (thanks Eirik!--yeah, I finally posted it!). As you can see, the exhaust is completely different, even from the Shadow's dual exhaust. Note how far back the footpegs are mounted. The specs are pretty much the same except for horsepower and torque rated a tad bit more than the American marketed VT500. 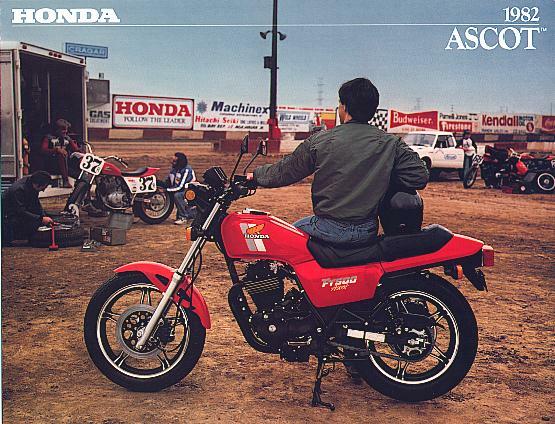 Another forgotten underdog of Honda's was the Ascot FT500. Click on the above pictures for complete brochures. 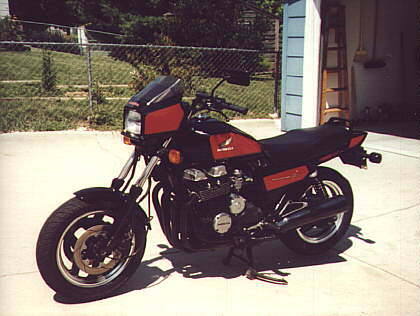 This model preceded the VT and was introduced in 1982. It shared Honda's showrooms with the VT in 1983. 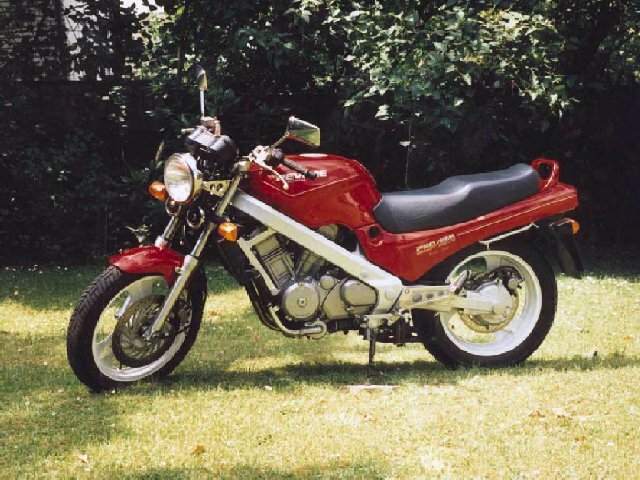 (In my opinion, this only CONFUSED buyers and the market for years to come, ie: FT500 Ascot, Ascot VT500FT If you say or type it out with the name or number switched around, you could be talking about the OTHER bike) Like it's 'brother', the FT only had a sales life of two years. It was an air cooled, chain driven, single cylinder, 4 valve street version of what dirtrackers raced. Essentially, it was a street version of the XL500. Being a smaller bike than the VT, it was fun and easy to ride. Unfortunately, it could not produce power like the VT could. It did weigh less than it's 'brother' to follow, but turned out to be much less of a performer than the VT. However, the FT has maintained or even increased its following compared to the VT. There are many groups that feature the FT as well as many aftermarket hop-up kits and spare parts available. 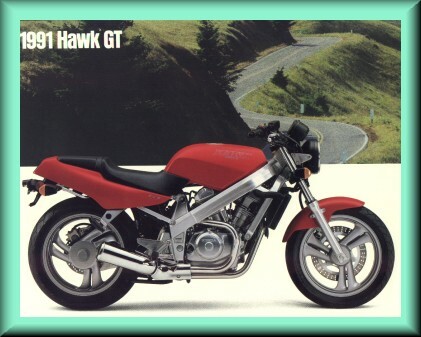 The Hawk GT 647 was another fine product from the VT line of Honda. The Hawk GT was introduced in 1988 and was produced through 1991. It was a newer version of the VT500 engine, bored and stroked from 491 to 647cc's to develop the best balance of power and torque. It was mounted on an unfaired, aluminum chassis very similar to today's superbikes. 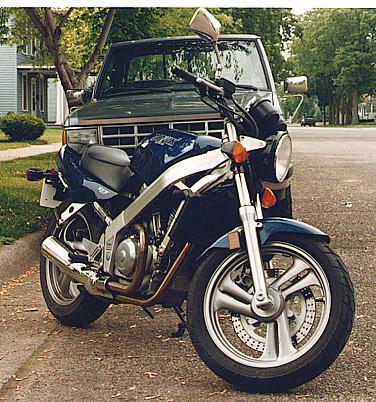 NOTE: this was the FIRST year Honda (USA) put a box aluminum frame on ANY motorcycle for US sales. It also featured the patented single rear swing arm that is found on today's VFRs. For 1988, it came in the [awesome] Tanzanite Blue and optional Metallic Gray. All succeeding years (89~91), it was only available in Red for U.S. marketed bikes. This GT was a cherry. 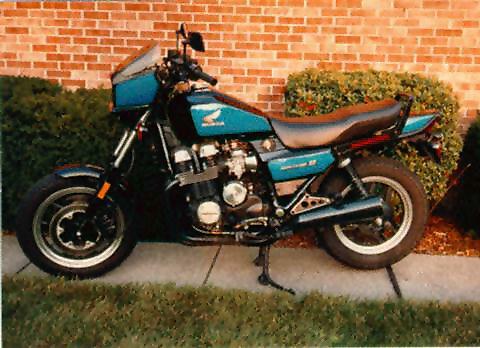 A blue 1988 model, with only 10K on it. I test rode it to see how it compared to the Ascot. There was an obvious difference between the bikes. The Hawk has a much lower center of gravity and was very nimble in the corners. I loved how it rumbled, just like a '69 Vette! I would rather have my VT500 engine because of it's higher red line. I feel a higher redline makes for better, wider power control to the rear wheel. But the Hawk had plenty of acceleration ability though. I'm too much of a touring rider and like the positive, upright seating position of the Ascot, not to mention the maintenance-free shaft drive compared to chain on the Hawk. I would like to own one but not at the expense of selling my Ascot. This is a NTV650 (aka Revere in other parts of the world). This photo was sent to my by a fellow VT enthusiast. It happens to be a '94 model. I am uncertain as to what years it was produced, or if it was to replace the 650Bros (Hawk GT equivalent in parts other than the US). I'd own one if I could get my hands on one! I do like the torque that the Hawk produces, not to mention the light-weightedness of the bike, but to get all that PLUS shaft? Count me in! I'll try to scare up some more info on this (hard to find) bike. If anyone knows ANYTHING about the Revere, please send it to my e-mail address! 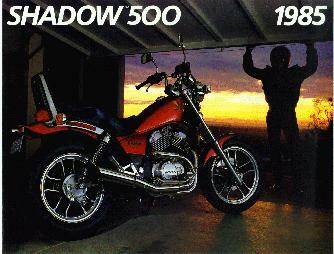 Here is an '83 Shadow 500. I believe only a couple of differences occurred over it's first generation model. The side battery covers were chrome on '83 models, whereas succeeding years came with color keyed covers. Also, for '83 and '84, the tanks more resembled those on Ascots with distinct lines on the sides, and slightly larger fuel capacity than the upcoming 85/86 models. On '85 and '86 models, the tank was a smoother teardrop design, the headlight went from being rectangular to round and the engine side covers changed to all aluminum versus it's original black with aluminum accented centers. Also, notice that the footpegs were moved forward slightly on the '85 and '86 models too compared to the first two years. 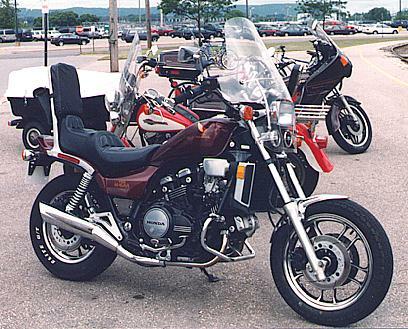 These are '84 Nighthawk S (700cc). '84s came in red and blue respectively. A change for '85 was the pinstriping for each color. Instead of the same shade of color, Honda used a lighter shade of the color used (i.e. light red on red, light blue on blue). I don't have a picture of an '86 model, but I believe the only color offered was a darker navy blue with white areas (similar to the red & blue schemes) outlined with red pinstriping, making it appear to be red, white, and blue. The worst thing they did was paint the wheels solid black along with the engine. That is the worst the Nighthawk has ever looked. 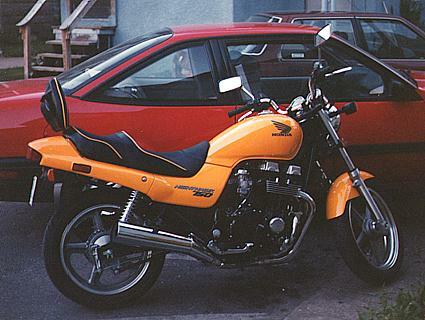 This one is a newer Nighthawk 750, probably somewhere between 93~97 because of the unique yellow color offered. I'll be adding more articles and photos on the Nighthawks sometime soon. 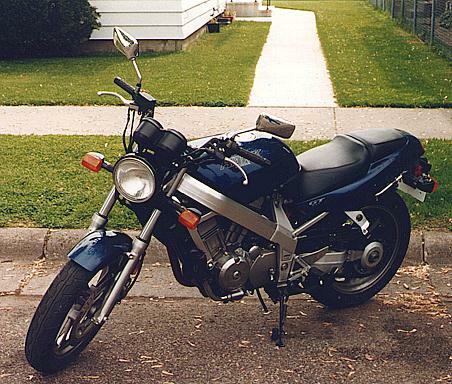 The Nighthawk 750 ceased production by 2004 due to a market change in demographics. I think it was a dumb move on Honda's part. 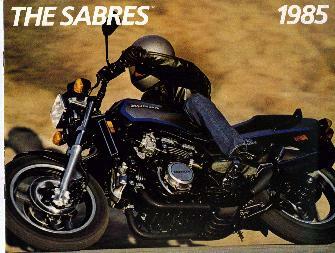 A bike that was much more popular than the Ascot was the Sabre. This awesome machine came out for a couple of years only as well. 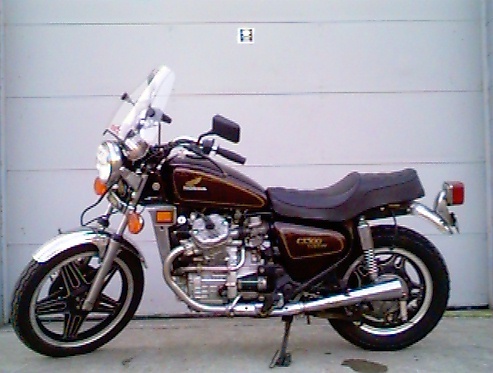 It was offered in V45 (1983 750cc, 1984~86 700cc) and V65 (1984~85 1100cc) models. This was (and still is) the same powerplant that is found in the Magna, as well as the Interceptors, now commonly called VFRs (and for this upcoming year, the VFR Interceptor). 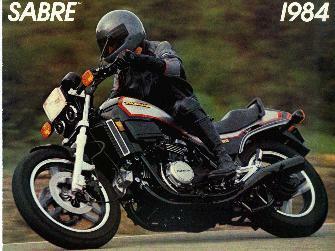 Again, the styling on the original Sabre is similar to the Ascot, just a pure street/muscle bike. I'm still not sold on the superbike designs as much as a street/muscle bike style. The resale is still phenomenal on any Sabre, either the V45 or V65. I particularly favor the blue/black/silver painted models (shown above in the '85 brochure). Sabres featured electronic instruments, including a digital clock. 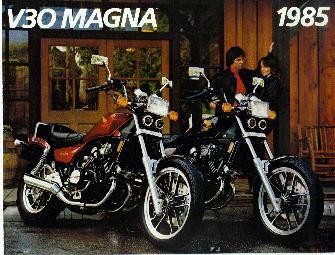 Similarly how the Ascot is the street version of the Shadow counterpart, the Sabre is the street version of the Magna series bikes. 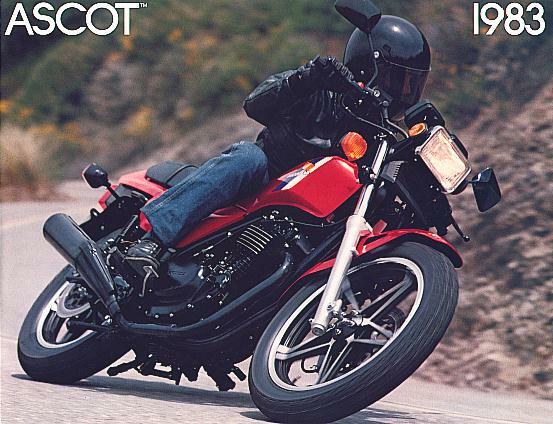 Ironicly, the Ascot was only offered in the smallest of the Shadow VT series engines, while the Sabre was offered in any size but the smallest of the Magna/Interceptor VF series engines (500cc / V30). 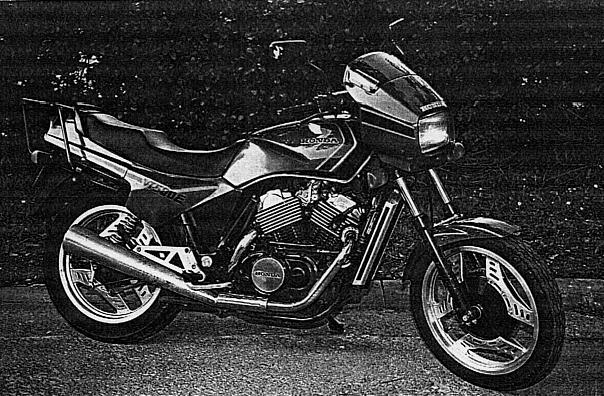 The only attempt to use a V-twin in a chassis similar to the Interceptor was the VT250. There is no engine relation to the VT500. Actually, it more resembles VF500 if you chop off half of it's engine, right down the middle. However, I don't know the years produced or any more information on this pocket bike. 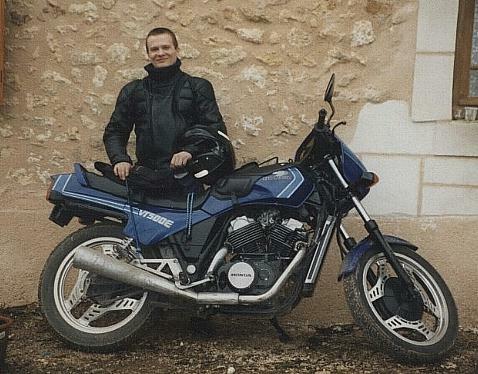 I'm told that the V65 Sabre was equivalent in performance to Yamaha's newer, formiddable V-Max. Not sure why exactly the Sabre was dropped from production. I suppose that the buying public swang either in the superbike or the cruiser direction, leaving the streetbike behind. 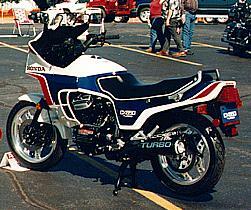 I strongly feel that Honda should re-release some of their more 'unique' bikes of yesteryear. For more information on the Sabre, check out this web site... <!-?G! 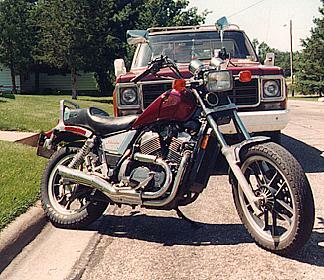 !LINKB-->Honda Sabre. 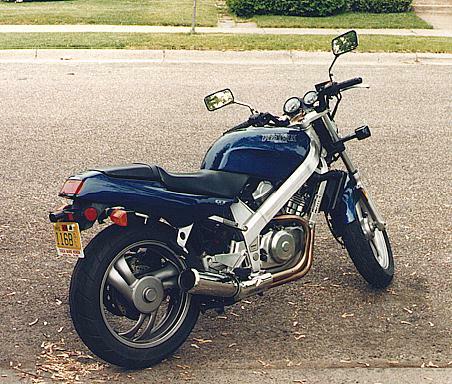 Unfortunately, the V30 Magnas (500cc) came as chain drive, while the two larger models had shaft drive. 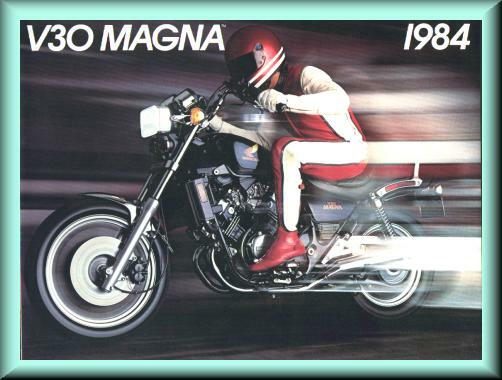 As my own personal opinion, I think the rider looks pathetic on the '84 V30 brochure because of the riding position--not really designed to go white-knuckling down a road. I'm not disputing the power of the little four, but it doesn't look like a racer, nor would I want to ride one in that fashion. 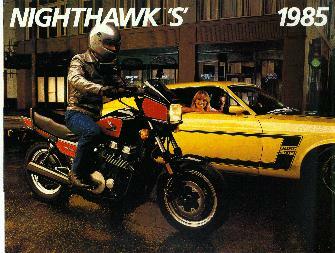 Another similar bike to the V30 Magna was the Nighthawk 550. I've ridden the 550 and it's one impressive little street cruiser. Very light compared to the heavier Magna, and it's redline is way up there too. But still a smaller bike. 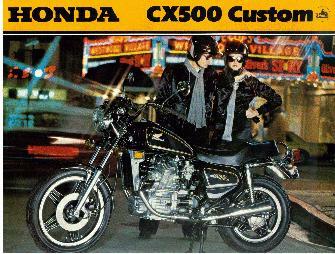 Lastly, another 'half-liter' bike of Honda's was the CX500/650 series bikes. 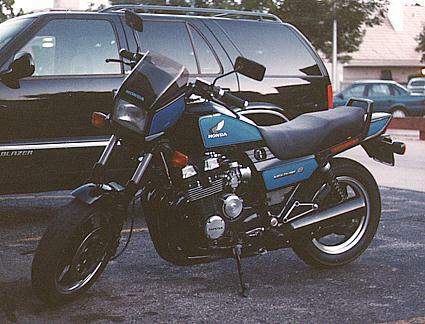 The CX series was produced from 1978 through 1983. 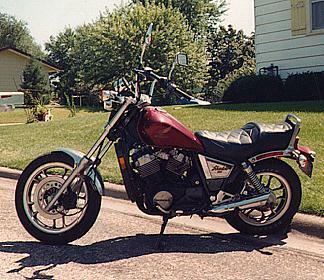 That puts it in the showroom for only one year with the introduction of the '83 Ascot VT500 but it was a 650cc engine only for that year. 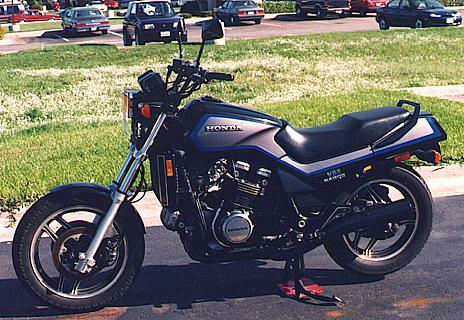 Although a very rare cycle in it's engine placement (similar to a Moto Guzzi), Honda produced too many of this engine platform cycle to call it a rare collector (in my opinion). I do feel it is a classic Honda product that shouldn't go unnoticed. 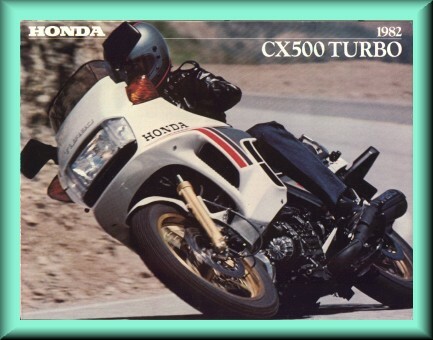 Honda did try to better the performance of the CX by marketing both a CX500Turbo and CX650Turbo respectively, however, sales just didn't recover to salvage the CX series. It's biggest market was for touring, since that is what it was designed for, although it would keep up with the best of them on back roads. You could get the CX500 & 650 as a SilverWing respectively for the same years of it's street version bike.